I’ve known Shannon Baker for several years. In fact, we launched books together, along with another pal, Peg Brantley. Shannon writes two mystery series. The Kate Fox mysteries, set in rural Nebraska cattle country are STRIPPED BARE and DARK SIGNAL. The Nora Abbott series is a fast-paced mix of Hopi Indian mysticism, environmental issues, and murder. The first in the series, TAINTED MOUNTAIN, is set in Flagstaff, AZ, where she lived for several years and worked for The Grand Canyon Trust, a hotbed of environmentalists who, usually, don’t resort to murder. It was a 2013 finalist in the New Mexico/Arizona Book Awards. BROKEN TRUST is #2, and the one I’m giving away, TATTERED LEGACY is #3. It’s a signed copy that one lucky reader will win. 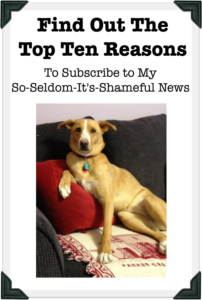 You must be a subscriber to my So Seldom It’s Shameful newsletter because that’s where you’ll find instructions about how to enter AND where I post the winner’s name. This entry was posted in Authors/Books You Might Like and tagged Broken Trust, Dark Signal, Kate Fox mysteries, Nora Abbott mysteries, Peg Brantley, Shannon Baker, Stripped Bare, Tainted Mountain, Tattered Legacy on December 29, 2017 by Becky. Would love to win Tattered Legacy as Shannon is a new author to me & it sounds like a good read. Thanks for the chance to win it! Happy New Year! Isn’t it fun to discover new authors and new series?? I have read both of Shannon Baker’s series and enjoy her style very much. Thanks for the chance to win a signed copy! You have excellent taste, Marla!